In Eclipse, you add files to a folder using drag-drop, e.g. from a folder on your machine or a file server. You can also use the Eclipse Import wizard. Once files populate the asset files folder, they can be used in the application for e.g. Image definitions. The icon used for each file depends on the file type as well as what external programs are installed in the machine, e.g. to handle editing of images (here Adobe Photoshop is used). 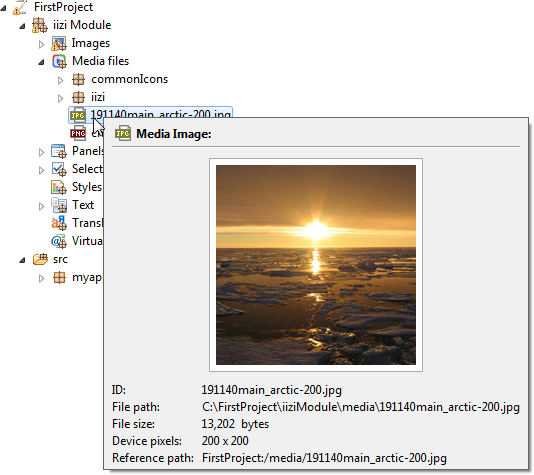 As you may notice, there is a Reference (or Reference path) to the image that is unique in the workspace. For more information about references see the chapter References. Other details about the selected element are also shown in the tooltip depending on the element type.